You are bone weary. You are not sure that you can move. You look at your limbs like they do not belong to you and they have no interest in doing what you want. Your energy is on strike and you can not afford it. We have all felt this way. It has a cause and it has a cure. It is easy enough to write off the symptoms of fatigue to poor diet and too much work. If only it were that simple. It is easy enough to fault the individual for some weakness that causes them to not be “strong” enough or responsible enough or whatever enough. It is easy enough to blame bad genes or the weather or some other factor outside of our control. The reality is that we are living in an unusual time in human history and understanding context is key to making your life more manageable. There has never been this number of human beings on this planet that has become so complex that no one can manage it anymore. Our world is out of control in more ways than one, and you are feeling the effects. One of the causes of overwhelm for sensitive people is not weakness, it is the volume and noise of a highly challenged and challenging world. It is not your fault. But you still need solutions. stimulants like coffee and sugar snacks do a number on your body by upping the sugar that sets you on the road to metabolic disorder and diabetes. It’s a high price to pay for a temporary boost that depletes us later. It’s a kind of deficit spending for the body. working harder is another often used approach. We have all heard the expression that there are not enough hours in the day. One Ayurvedic doctor told me that working six hours a day was considered far superior for health and more natural for us than our current culture of long hours and 24/7 availability. distraction can help us pump ourselves up. Loud music and entertainment can create a high of sorts which is not actually restful and may negatively affect the nervous systems of highly sensitive people. reaching for food is actually a rational instinct since food supports our health and ability to function. Unfortunately, one of the challenges extremely busy people have is that much of our food supply is processed and full of all sorts of chemicals as well as corn syrup and other ingredients that increase weight and act as stimulants to the body. Because processed food is so high in calories and low in nutrition it can cause people to want to eat more to meet their nutritional needs and when they are tired their nutritional needs rise. Fatigue can, therefore, contribute to weight issues. Fatigue is important information that needs to be listened to. It provides valuable information about how to manage ourselves and our work that can support long-term effectiveness. It can help us learn how to pace ourselves. All of the unhealthy ways we have of handling fatigue in the short term affect our perseverance and staying power in the long term, because they take a weakened state of being tired fatigue, and make it worse. Over a long period of time, inevitable chronic problems will develop. Highly sensitive people are very conscientious which can make them more easily tired. By taking poor fatigue handling strategies off the table and working with the body’s nature, HSP’s start to level the playing field on fatigue management. 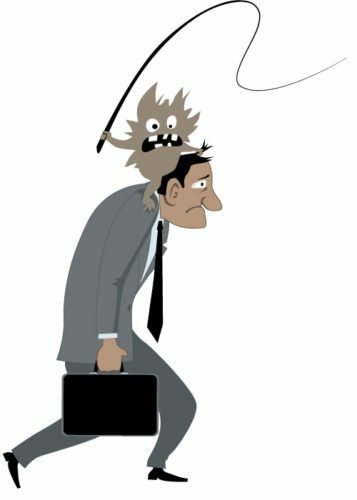 Getting the monkey off your back is not a quick fix. you need to accept how out-of-control the world is and accept that you probably will not fix it. you need to put your health ahead of saving the world. you are not responsible for other people’s expectations including their expectations of a perfect world. Once you have accepted these things you are ready to work on your life. You must start by making a list of priorities putting health at the top of your list. Getting on a health maintenance plan that supports your highest functioning will help you handle work better and help you feel better at the same time. MAPI, the Ayurvedic website, recommends strategies based on the type of fatigue you are experiencing: mental, emotional or physical. They offer some tips and case histories of how some individuals were able to recover from fatigue. (You can check your dosha type here.) Now you can tackle simplifying your life. what do you take on that is unnecessary? when do you help others when they should be helping themselves? You do not want to deprive others of empowerment opportunities! what do you do that pleases others but is totally draining to you? is your home and office cluttered? See if you can reduce one “obligation” or source of clutter a day. Decluttering your life takes time, which is a good thing because freedom takes time to get used to. But it is worth it and you are worth it. And by the way, when someone brings you a monkey, say no!